My love for my bullet journal knows no bounds – seriously, more than anything else, that little notebook is how I keep my entire life organized and documented. It’s an organization tool and memory holder all in one, and I’m a full convert from traditional planners to bullet journals. But getting into it is hard – as someone who spent quite a while trying to get comfortable with the format and the idea of literally building your whole planner yourself, I can definitely attest to that. 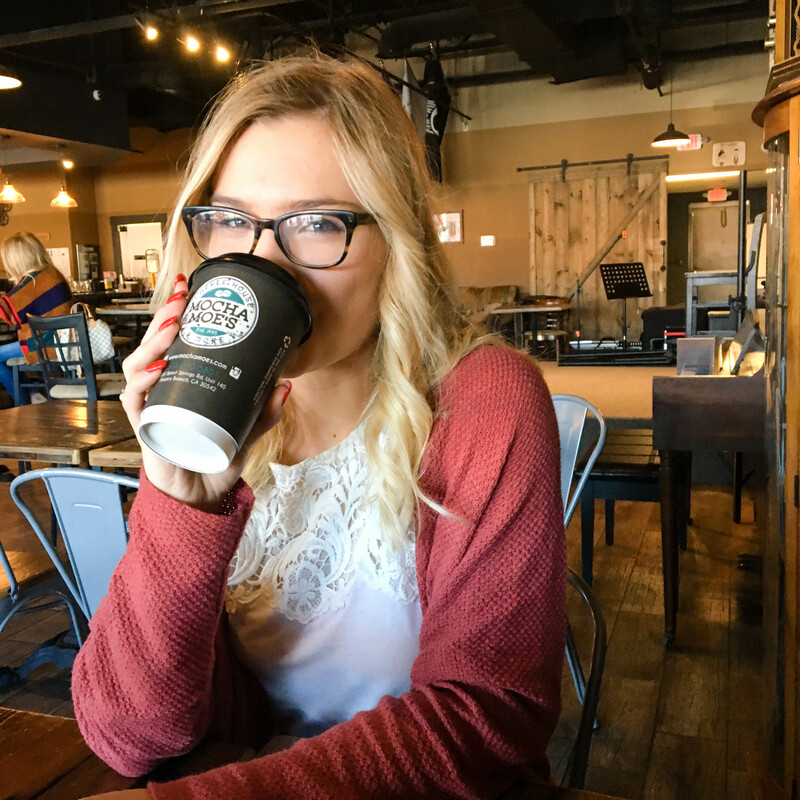 So I poked around on the Internet and asked y’all what your biggest questions about getting into bullet journaling were, and used it to put together this post. 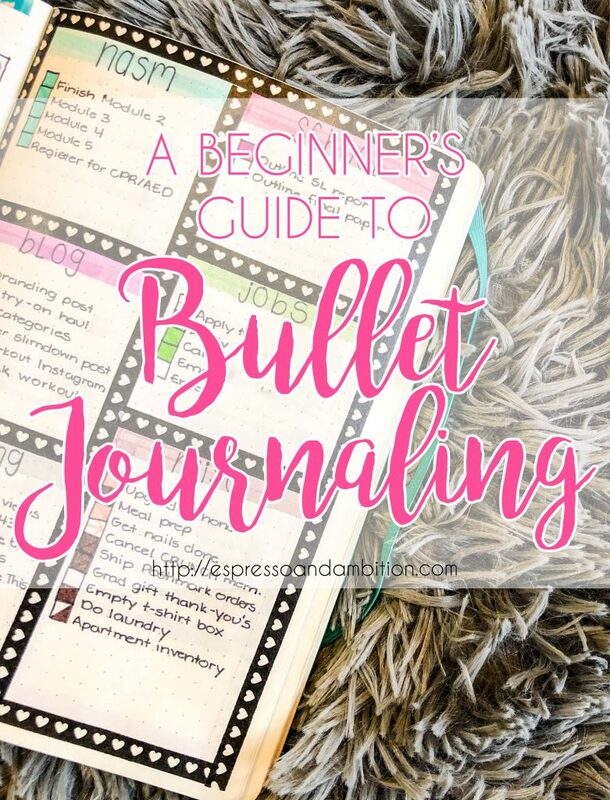 So if you’ve ever thought about starting a bullet journal, or you’re just getting into it, this is for you. 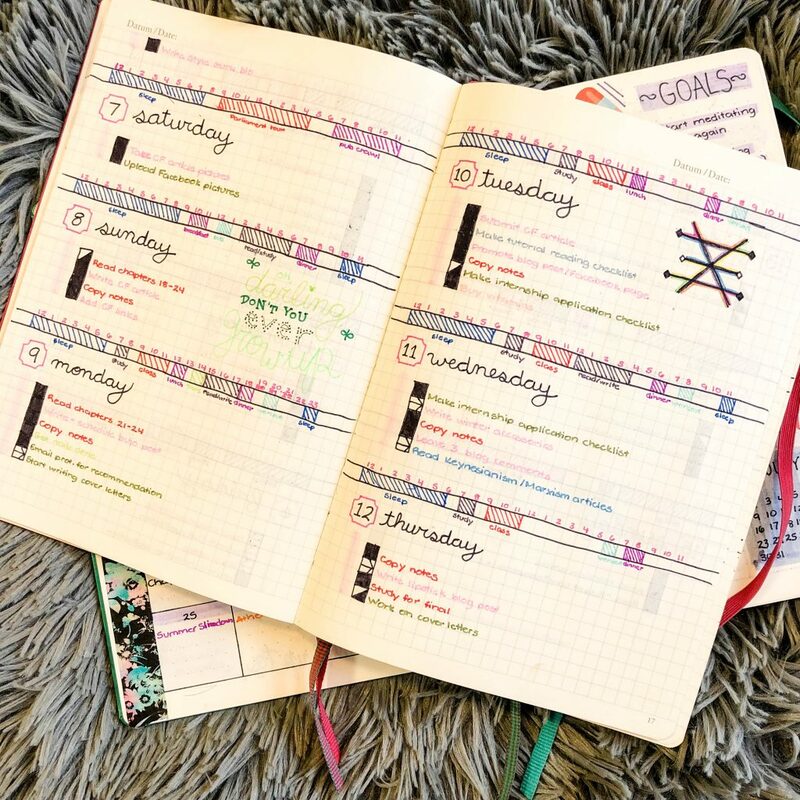 If you’ve gone on Pinterest or Tumblr to look at bullet journals, I don’t doubt that you’ve seen elaborate spreads with stickers and washi tape and all sorts of fancy stuff. And while those things may be fun, I’m gonna be honest: I wouldn’t recommend starting off with them. Yes, they’re pretty, but they’re also distracting from the main purpose of the bullet journal, and until you get comfortable building spreads, adding a whole extra layer of decoration is just a whole lot of extra complication. One of my very first spreads. There are literally infinite options of things to put in a bullet journal. Which is amazing, but also very, very daunting. You’re customizing an entire planner to your own specifications – so it’s time to figure out a game plan. I found that the best way to do this is to write out a list of the things you’ve liked about previous planners, and the things you found you didn’t use/like – for example, I need a daily hour-by-hour breakdown in my spreads, but I also need somewhere to keep track of running to-do lists for the week. So having a spread where I can track those to-do lists on one page and those daily breakdowns on another is the central theme of how I structure my journal. This weekly spread is my favorite! I’ve been using it for over a year now. Without a doubt, the most common thing I’ve heard about bullet journaling is: “I’m too much of a perfectionist for that!” or “what do you do when you mess up?” To the first statement, I say: I promise, I am just as much, if not more of, a perfectionist. 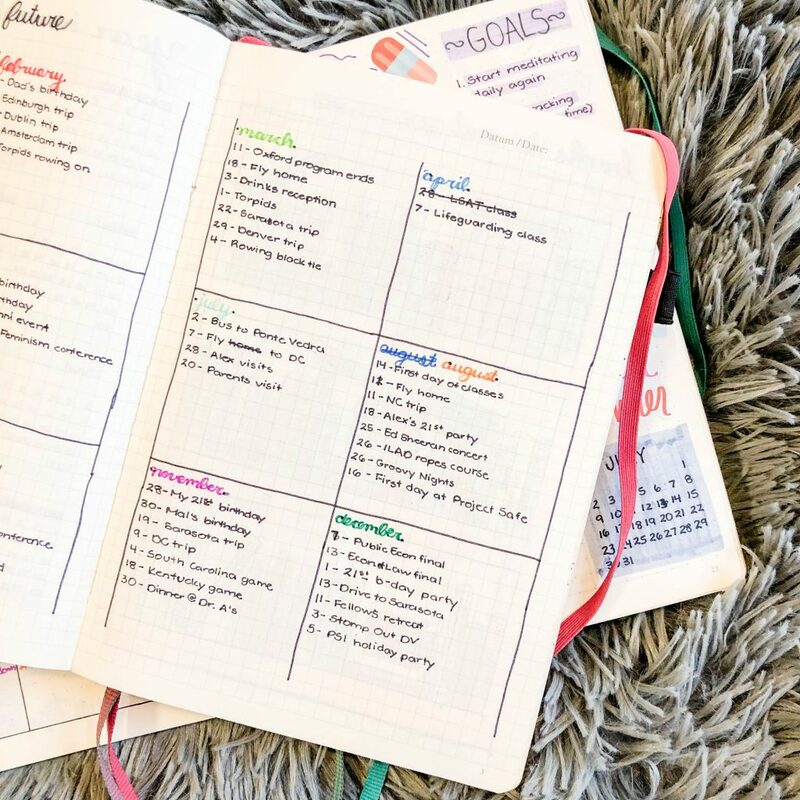 Use your bullet journal to fight those impulses – no one’s going to see this except you (unless you choose to post it on the Internet like I do), so you’ve got free reign to make as many mistakes as you’d like. Which leads into the second question – the answer is, you just roll with it. You drew a line in a weird place, you misspelled September, you used the wrong color – it’s whatever. Fix it the best you can, and move on. The original big mistake of 2017. So you’ve got your cute little bullet journal layouts done, so now comes the tricky part: keeping up with it. The biggest tip I can share here is to find a way to make it a habit. Set up certain times of day and certain times of the week that you specifically sit down with your bullet journal and get things sorted. 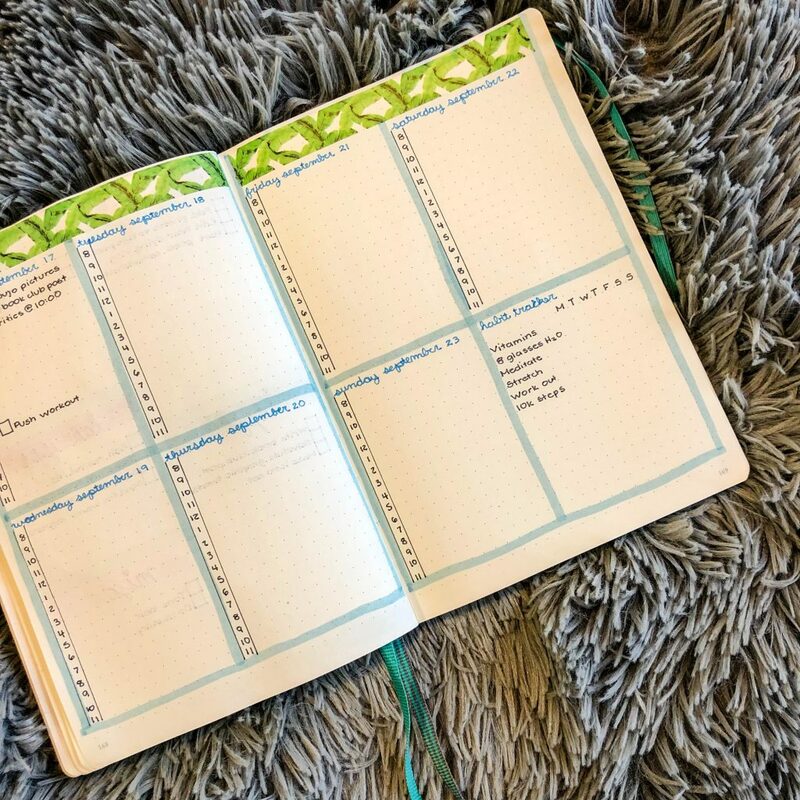 For me, I like to do my weekly spreads on Sunday nights – it’s a great way to lay everything out for the week ahead, and I’ve found it generally clears my mind to get everything laid out on paper. And then I usually check in on it every morning once I get to work; I copy any meetings or tasks for the day into it, update my trackers, and generally get my mind in the right place for the day. It’s become a really calming thing for me, really. Another thing to note here: if you miss a week, or don’t fill out half of a spread – don’t stress about it. Tying back into the perfectionism thing – if you miss a few days, literally no one will know but you. Playing catch-up is miserable, so I’ve found that it works better to just jump back in on the current day instead of backtracking through all the days you missed. Have any more bullet journal questions? Let me know!